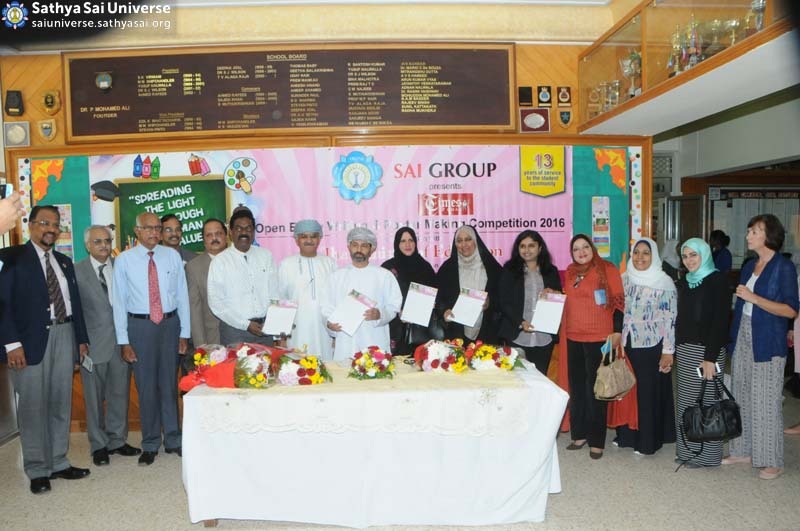 Since 2003, Sathya Sai volunteers in conjunction with the Ministry of Education of the Sultanate of Oman has organised an annual essay writing and poster making competitionon human values themes, involving various schools in Oman. The project, titled “SAI – Times of Oman’s Spreading the Light through Human Values Open Essay and Poster Competition,” is supported by the United Nations Educational, Scientific, and Cultural Organization (UNESCO). As in previous years, the competition took place in three phases. The first phase, held on 9th April 2016 at the Indian School in Al Ghubra, was intended for schools in the Muscat Governorate. Students from Omani Arabic-speaking schools, including private, international, and special education schools in the Governorate, participated in this competition. The Director General for Curriculum Development of the Ministry of Education inaugurated the competition in the presence of school principals, teachers, and corporate guests. The second phase of the competition took place on 16th April 2016, for the Indian Schools at Sohar, Nizwa, and Ibri, which are located in different Governorates. At each of the three schools, senior education officials from the respective Governorates and the national Ministry of Education officiated and expressed their appreciation for the work accomplished in promoting human values education. The results of the competitions were published on 19th May 2016 in the country’s leading English language newspaper, The Times of Oman.